This was an exceptional tour. We had an excellent guide who was top notch in explaining the details of this stunning church. After 1 hour and 15 minutes of touring there, we took a bus to Park Guell with a new guide, who was also very good. This time the group was a mix of English and Spanish speakers, so there was down team for everyone, while the guide repeated the narration in the other language. The tour ended at Gaudi's apartments, with commentary explaining their history. A well spent 41/2 hours. The day of the tour was raining. We had an excellent tour of LaSagrada. We were then turned over to another guide for Park Guell. It is several miles out of the city. When we got there, he decided it was raining and we would skip this. The park was opened and we saw people going in and out and other buses were there. When I stated I wanted to go, he told me he would give me my ticket and I could go myself. He further told me it would be my responsibility to get back to the city, which as stated was several miles away. What was really galling was the bus was returning to Barcelona for a walking tour, which was also in the rain. That he was willing to do. We were told there were no rain checks for Park Guell. This was a major disappointment. The tour provided an extensive tour and commentary by the guide of the Sagrada Familia as well as a bus ride to the park, which would have been a very steep walk. It also included visits to the exteriors of two Gaudi houses with commentary by the tour guide. The skip the line aspect was a real bonus in the Sagrada Familia, as the lines were very long. Well worth the price. The Sagrada Familia part of the tour was enlightening. The Gaudi part Artistic Barcelona was a bit of a disappointment. We spent a lot of time traipsing around greenery in Park Guell and seeing only some of the Gaudi sculptures we knew were there. When my husband spied a chapel and asked if we would return to it, the guide said we would, but we didn't. Also, the combined tour started too late, and we were exhausted trudging toward the last few houses. The guide said the last one was a block away when it was about 3 blocks away. Still, though, we learned some interesting factoids about Gaudi. I recommend that if this tour is combined, it start earlier--or that it NOT be combined and that the guide take more time in Park Guell viewing all that is actually there. 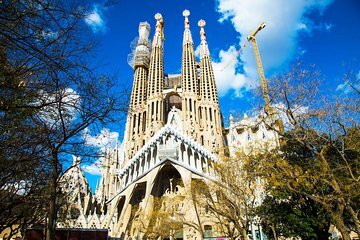 You can't go to Barcelona without visiting this church. My wife and I have seen lots and lots of churches in many countries but this is the most spectacular. We are not Catholic but this is truly a spiritual House of God. We would love to attend a service in the cathedral but our schedule did not allow that to happen. The church is always crowded so this was a reasonable tour. We had about 2024 people on the tour. The guide truly loved this church and knew everything about it. We highly recommend visiting the church. The second part of the tour was to the park. We enjoyed it but not nearly as much as the church. If time is limited just do the church. The tour guide was fine and the tour of the park and other buildings was ok but it got long.